Talkshow "Reading - Happy Journey"
On the evening of October 22, 2017, the Youth Union of PPA in collaboration with the Intramural Magazine - Radio Club and Book Club successfully organized the Talkshow "Reading - Happy Journey" program. In the exciting atmosphere of the new school year and the 50th anniversary of PPA establishment (May 15th, 1968 - May 15th, 2018), on September 17th, 2017, the PPA Youth Union held the “Green Dream” show to welcome freshmen of course D43 and the 4th course of Criminal justice specialty. PPA actively responds to campaign "Volunteer Summer"
In responding to the campaign "Volunteer Summer", from 26th-30th June 2017, the Youth Union of the PPA and Thai Nguyen Association of Fellow-Countrymen at PPA organized volunteer work at Hoang Nong commune, Dai Tu district, Thai Nguyen province. Here, the volunteer delegation has done the "3 together" motto (eating, living, working) with the people. On May 22nd, 2017, the PPA Youth Union collaborated with Club of Radio and Internal journal to organize the talk show entitled “Books and belongings of PPA youth”. This activity happened after the success of the recent “Reading Festival” at the PPA. In the morning of May 15th, 2017, the PPA Youth Union organized a Book Fair with theme “Reading books for future” with the participation of many publishers and received a great response from the students. In the evening of May 15th, 2017, the PPA Guitar Club held Guitar show with theme “Rain in May” at the PPA. This annual event was organized to create a healthy and useful playground for students who have passion for music. After 6 months of training, on April 13th, 2017, PPA organized the Closing Ceremony of the first training course for all students of course D42 with many activities. On March 31st, 2017, the PPA held the competition of Excellent Class Group Leaders and the Model Class on execution of the Public Security regulations. This activity aimed at implementing the plan of the Politics General Department on the organization of activities to promote the movement of good teaching, study and practice in the police training institutions. On April 04th, 2017, the Opening Ceremony of Competition of Shooting and Martial Arts for the youth of the Public Security force in the North in 2017 took place at the Center for Training and Sport of the Public Security force. The PPA’s students participated won the third prize for entire group in the competition. With the consent of the Party Committee, Board of Directors of the PPA, from April 8th, 2017, the PPA Youth Union organized a series of sport activities for the students to welcome the 17thPPA Communist Youth Union Congress, term 2017 - 2019. On March 25th, 2017, the PPA Youth Union cooperated with some prestigious hospitals in Hanoi to hold the Voluntary Blood Donation Day at the PPA. This activity attracted the participation of many members of the PPA Youth Union. "Creative, surprising, attractive, right as style of high-tech" - These are nice words by the Board of Examiners and guests commenting on the Good teaching and learning emulation of High-tech Crime Prevention Police Faculty which was held at PPA on March 21st, 2017. On February 28th, 2017, the Department of Student Management and the Youth Union jointly organized a Ceremony to launch the Campaign “Building the People's Public Security style “Bravery, humanity, for the people to serve”” and the Youth Month 2017 for students. 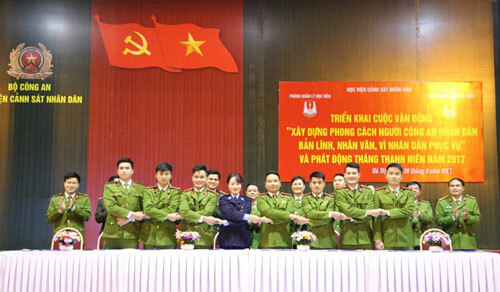 This is one of many activities of the PPA Youth Union to mark the 86th anniversary of foundation of Ho Chi Minh Communist Youth Union and to celebrate the 17thCommunist Youth Union Congress of PPA. With more than 6,000 members, the PPA Youth Union has always promoted dynamism, creativity and initiative, made effort in learning, actively participated in volunteer activities for community, contributing to the development of PPA with a historical depth of nearly 50 years of formation. On November 25th, 2016, the PPA held a voluntary blood donation festival with the support of the Central Institute of Hematology and Blood Transfusion and Hospital 198 - Ministry of Public Security.